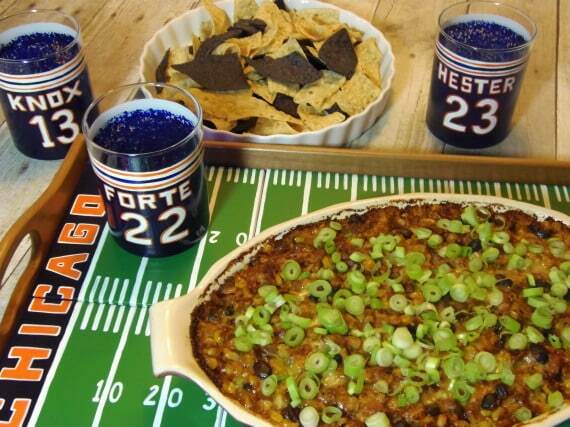 This week’s theme of #SundaySupper is tailgating and I’m going to be totally honest here. I’ve never tailgated. The closest I’ve ever come to tailgating is a few beers in the parking lot before the game. 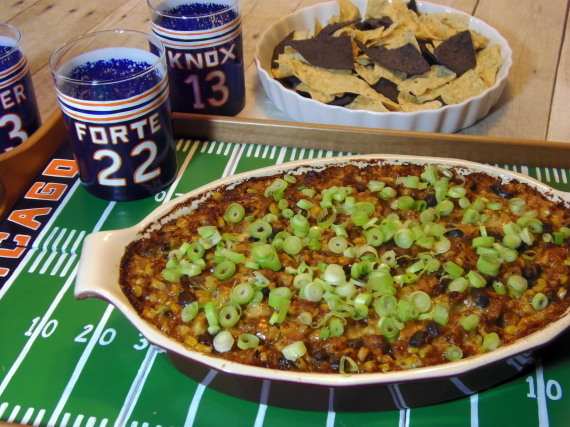 But if I ever had tailgated, or if I ever do (it’s never too late you know), I’d like to have my Corn And Black Bean Dip be a part of the menu. It feeds a crowd, it’s easy to transport and everybody loves it! SCORE! This amazing dip is loaded with fresh garden sweet corn but in a pinch you can also use frozen sweet corn when garden sweet corn isn’t available (think February for Super Bowl parties). This recipe works well for when you’re sitting out in a parking lot on an uncomfortable lawn chair, or for when you’re sitting on your comfy family room couch with the dogs next to you and a blanket on your lap…which happens to be my favorite place to watch a football game. 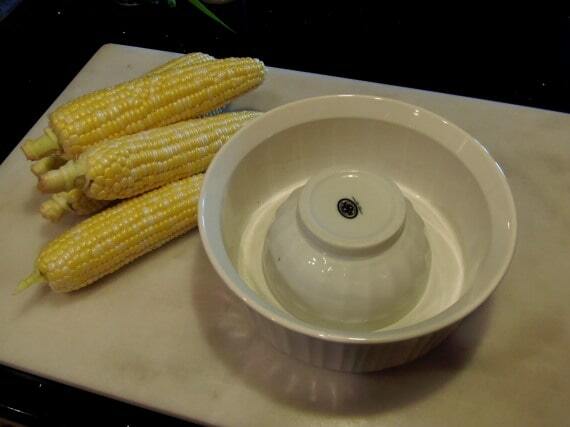 6 ears of sweet corn, husks removed and kernels removed* (preferred), or 6 cups of thawed, frozen sweet corn. -In a large skillet cook the bacon until crisp and reserve the grease. 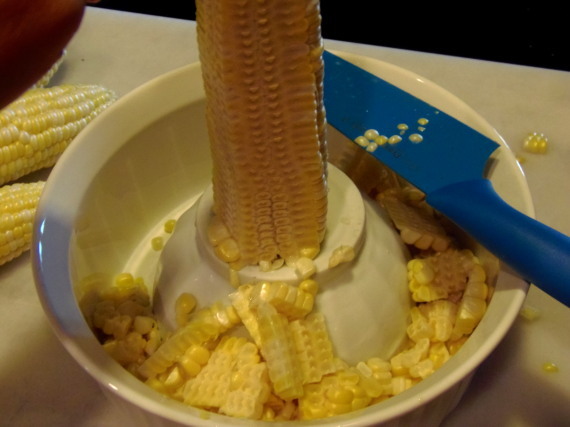 -Meanwhile, using a sharp knife, remove the kernels of corn from the cob. *Note – I place a small bowl inside a large bowl. 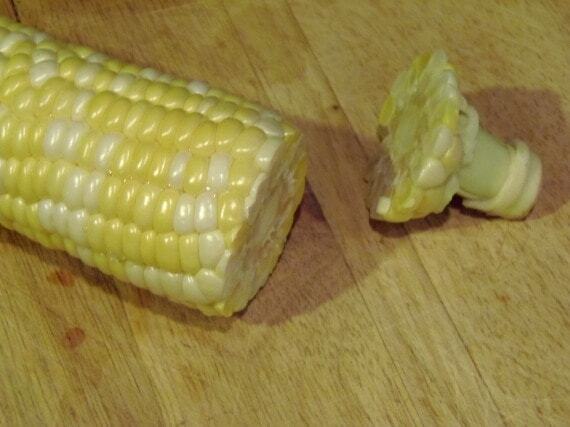 Slice the bottom of each corn so they sit flat. Place each cob cut side down on the smaller bowl. Then, using great care, slice the kernels off the cob. The large bowl with catch the kernels as they fall and you won’t have a giant mess on the kitchen counter (with any amount of luck). -Add in the orange bell pepper, garlic, black beans, fire roasted jalapenos, salt, pepper, cumin and cayenne. -Lower the heat to medium and stir and continue to cook for an additional 3-5 minutes. 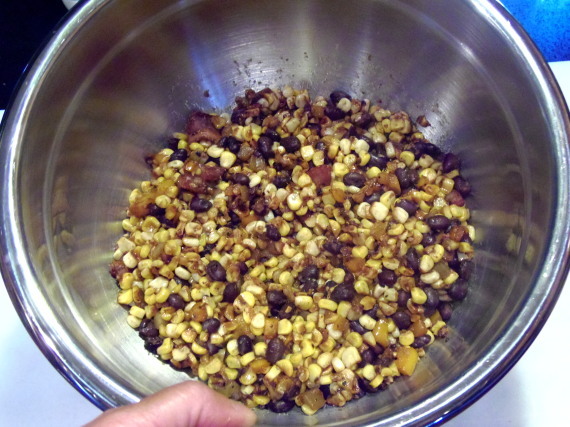 -Remove from heat and place the corn mixture into a large bowl. Cool slightly. 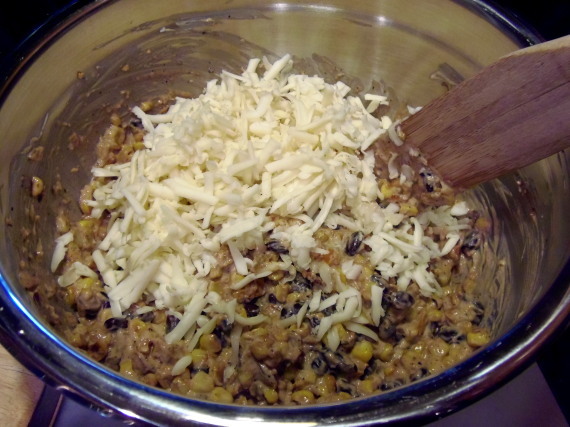 -Into the bowl with the corn mixture add the mayonnaise, Greek yogurt, shredded cheese and sugar. Gently stir to combine. 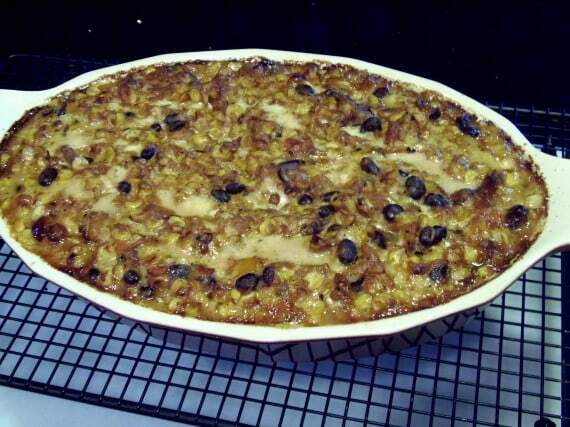 -Prepare a 2 quart baking dish by spraying it with olive oil spray and spoon the corn mixture evenly into the dish. -Bake the dip for 30 minutes or until the cheese is all golden and bubbly. -Top the dip with the sliced green onions, cool slightly and serve with the tortilla chips. *Note – If you’re planning on traveling with this dish, say to a tailgate, allow it to cool uncovered for approximately 30 minutes on the counter and then cover the casserole dish with aluminum foil until you get to your destination. This dip is just as yummy hot and gooey as it is warm and not so gooey, so no worries if you don’t serve it directly from the oven. So there you have it, a delicious appetizer that works well for any gathering you may be having (or attending). It’s certainly not just for tailgating but since it’s that time of year, why not right? 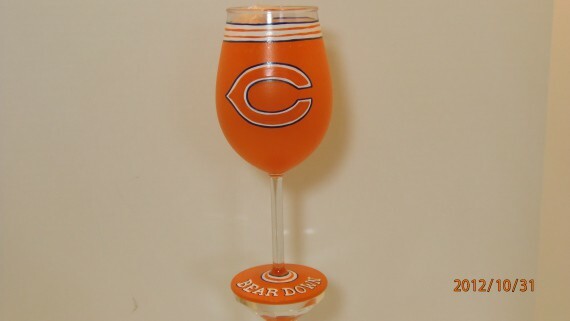 Now, I don’t know about you but for me I also like a little something to drink (cocktail or otherwise) while I’m munching on delicious dips and watching the game on TV…. GO BEARS! Please contact me if you’re interested in ordering your own ceramic tile team tray or a team jersey wine glass, tumbler or pilsner. They make wonderful gifts for any sport or team (college or pro) you’re interested in. All items can also be personalized in anyway you choose. WIN! WIN! 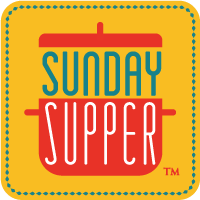 The #SundaySupper team has given you a wonderful preview of what is to come. I hope you will join us on Sunday to check out all these delicious recipes. I've never had corn dip, but it sounds great! I'm really looking forward to giving it a try this football season. I really think you'll like it Lane. I hope you do try it. Thanks for stopping by to visit! I love the idea of your dip! So many yummy flavors!!! 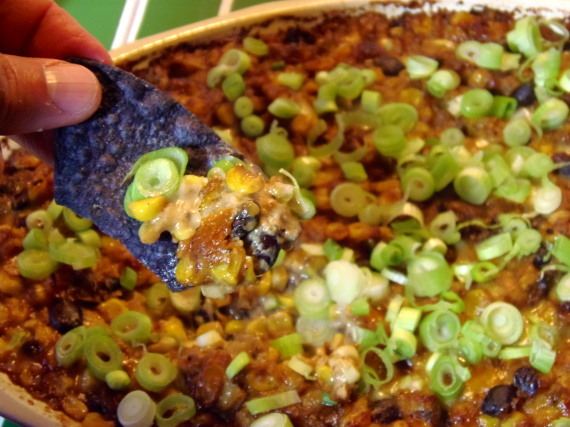 I love corn and black beans,…and combining them in a dip sounds absolutely perfect. This looks delicious!! My kids would love this dip! Looking forward to making it during gamedays! This sounds so great!! All your glassware is cute! Thank you so much Megan. I really appreciate it! I think you've just shown me how to convert my husband into a corn lover–can't wait to try this! Do you know what good timing this dip is? I just got 8 ears of corn yesterday to pile on top of 3 I already had from my CSA. I'm swimming in corn right now! Swimming in corn is not a bad thing at all. 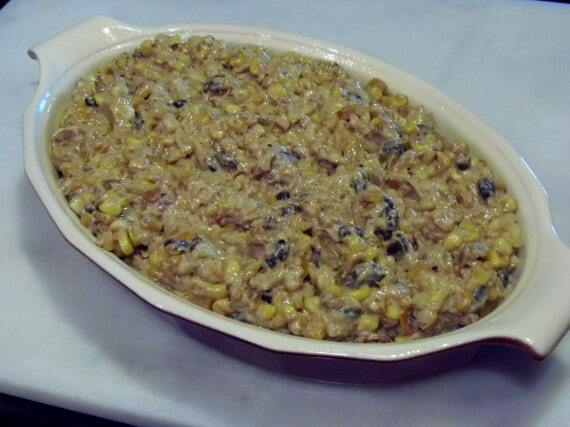 We've been corn crazy for months now and this is a great recipe to mix things up a bit. Hope you like it Susan! I love this dip…I want it now!! I also need to know how much you charge for the serving trays and the painted team glasses. I'm looking for holiday gift ideas for my fellow Texans fans, and this would be one-of-a-kind! Can you e-mail at wendyweekendgourmet@gmail.com? Hi Wendy. Thanks for your interest. I'll be sending you an email. I would NOT share this dip! Great dip! A pleaser for sure. So many lovely flavors all blended together! Perfect party dip! I could definitely make a meal with this dip! Sweet corn is one of my favorites. Oh, I definitely need to make this. 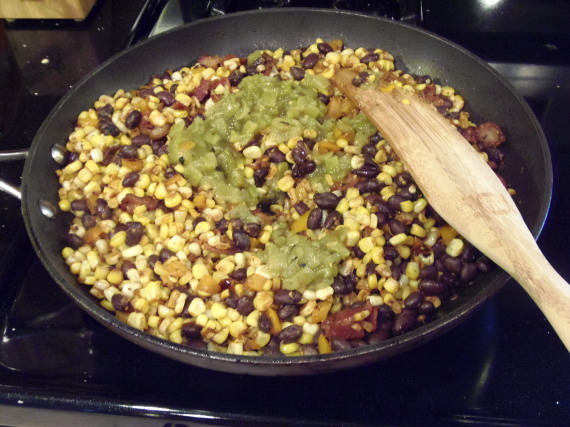 I love corn and beans together…and everything else in there, as well. I'm making a big ol' batch of chips with this dip next week, for sure! Love your serving tray and glasses! Super festive. This dip looks great and you could totally use any leftovers on nachos! Love black beans, Renee. Got to try this dip! Oh wow Renee this looks incredible. Yet another dip that I know I would end up eating instead of dinner. Looks delicious! I love the way you get the corn off the cob! It's a good thing this recipe makes a big batch because that would mean there *may* be some left for other people. "May" being the key. I'm thinking this will work just as deliciously without the bacon (I know – heresy! ), cuz it's got some of my favorite flavors in there, too! Yum!